This table was made just after my commission for the Fay Side Table. 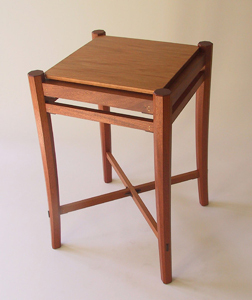 The design details remain the same while I made the proportions more suitable for a pair of side tables. The legs are eight-sided and they taper and flair at the bottom. The joinery is connected with wenge wood splines that are locked in place with brass pins. The top, made of highly figured African mahogany, is lifted slightly above the upper rail, creating a floating effect. The lower stretchers also have a wenge wood spline joint to emphasize and strengthen the intersection.